Digital Literacy classes provide a space for students to learn technology skills that are essential to furthering their education, being successful in today’s job market, playing an active role in their child’s education, and much more. 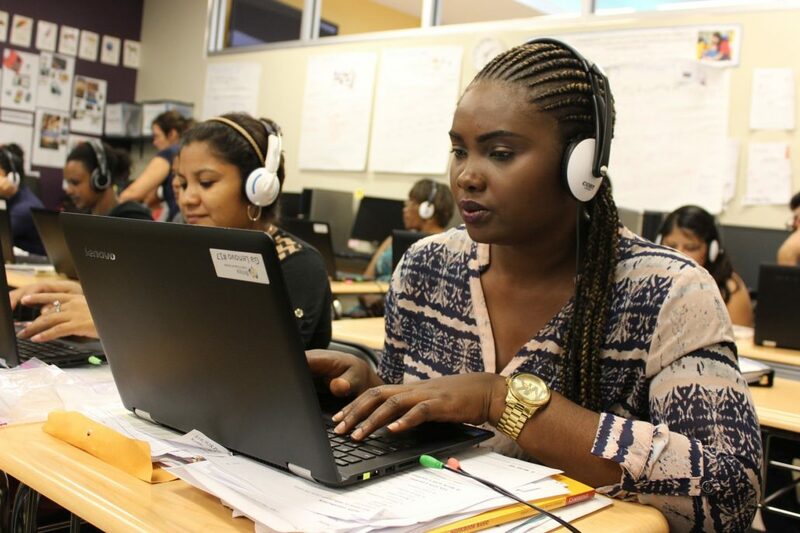 Each level of adult instruction in Briya’s Two-Generation Program includes Digital Literacy classes. The Basic computer classes are designed for beginning low-literacy students who have little to no familiarity with computers. These classes focus on introductions to computer hardware, basic keyboarding skills, word processing and the Internet. At the Intermediate and Advanced levels, Digital Literacy classes provide further skill development with the Windows XP operating system, cloud-based programs, interactive language skills software and Microsoft Office Suite (such as Word, Excel, Publisher) for workplace and family applications. Digital Literacy instructors often integrate their content with that of English instructors. For example, an English unit on college preparedness asked students to explore various college websites, learn about the admissions process, fill out example applications, and ultimately visit a local college campus.